Eating pumpkin pie for lunch. Painting half a picture and promising to come back to it later. Thinking of a great blog post, being too lazy to write down blog post, and forgetting blog post. Being too bitter to think of a new blog post because THE ONE I JUST HAD WAS JUST FINE. Being too cozy to get up and get my drawing pad. But mostly, spending too much time on my holiday cards that I thought would take me one hour. Oh sure, I can make a lot of layers and make cool little motion blurs, but the truth is, most of the cool things you can do with Photoshop take time, and I’m more of a need-instant-gratification-type. 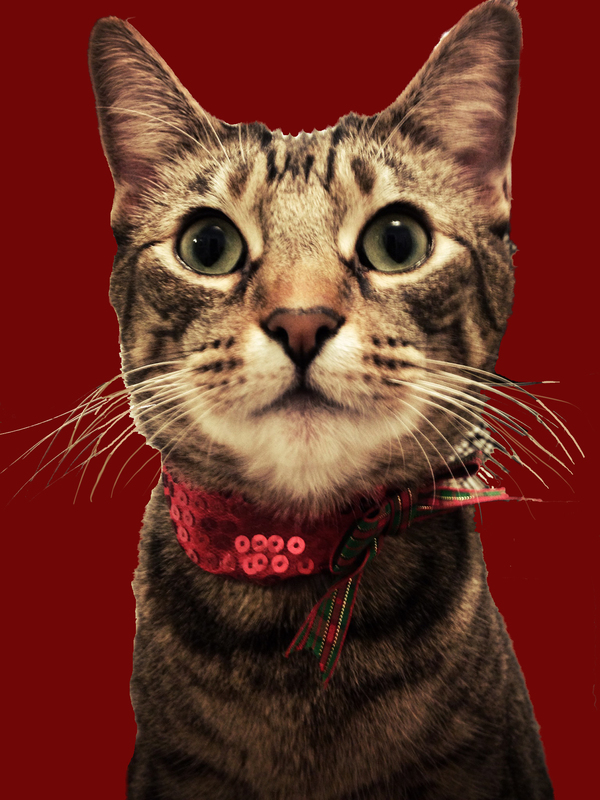 So anyway, I took pictures of us and our cats for our holiday cards and then realized afterwards that I had ugly things in the background because it turns out cats don’t like to take suggestions on where to sit and look cute. Four YouTube videos later, I was somewhat confident on how to remove a complex background. The problem was, all the approaches did not work so well for hair. Or whiskers. Unless you wanted to spend many hours zooming in with laser precision to go around each hair, which, like I said, need-instant-gratification-type. So I erased my poor cat Wizard’s whisker and just drew them back in. At this time, I would like to apologize to Wizard and all the other cats out there for my shameful behavior. That said, Hang Time and Wizard do look quite dapper in their holiday outfits, drawn in whiskers or not. P.S. Hang Time is the one wearing the tie, obviously. Wizard is the one who looks slightly askant at her whisker molestation. P.P.S. Hang Time would like to clarify that his whiskers have not been retouched. P.P.P.S. Hang Time can get a little petty over little details. Don’t tell him I said that. P.P.P.P.S. Of course I’m not showing you the pictures of the husband and I, because WE’RE CARTOONS AND THAT WOULD SPOIL THE ILLUSION! 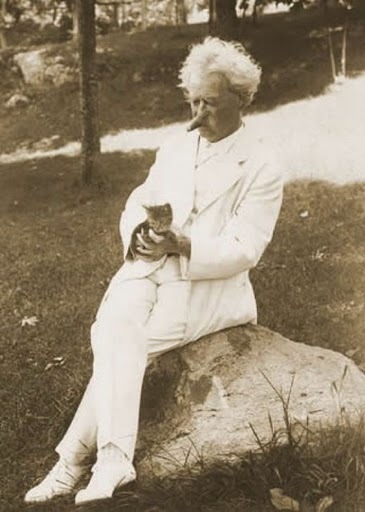 To make up for it, here’s a picture of Mark Twain holding a kitten. Why? Because it’s Mark Twain holding a kitten. 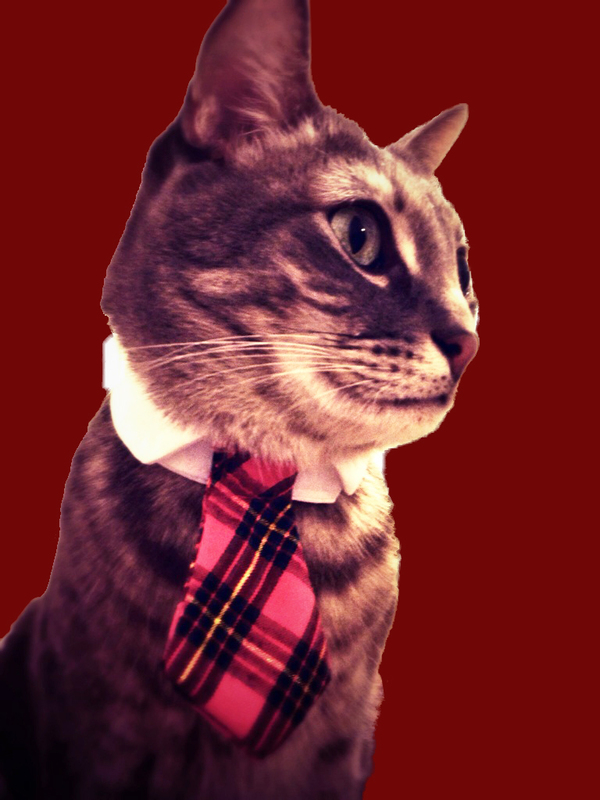 This entry was posted in Cats and Cats, Crafty Things, Holidays and tagged cards, cats, christmas, holiday, humor, mark twain, photoshop. Bookmark the permalink. Great sense of humor. Thanks for the laugh! OMG — I have *the same cats* — only fatter. Wow! You have some mad whisker-drawing skills! Put that on a resume! That’s the best quote in the history of quotes! This is the weirdest comment ever! I have typed in what I want to say and it comes out as something else completely with no rhyme nor reason as to what it is about. Weird! I am leaving this as is to see what happens. Your lines are kind of straight though, so you’re already 1,000 steps ahead of where I’d be if I had to fix whiskers. We tried a family photo with the dogs a few weeks ago. It didn’t go well. Hi, just been looking at your photoshop work, and wondering if you know where the “background eraser tool” is. ? I’m glad somebody else suffers from displacement. I’ve taken to sorting my holiday snaps from 2004 rather than send my Christmas cards. Dunno why, I mean, I’ve written them. Thanks for the Mark Twain photo, too. Can you make my cards next year, please pretty peas?